The mediastinum is a broad central compartment of the thoracic cavity. It separates the two laterally placed pleural cavities, and is enclosed on each side by the mediastinal pleura. The mediastinum contains all of the thoracic viscera and structures except for the lungs. It also serves as a pathway for the esophagus, thoracic duct, and several components of the nervous system, allowing them to traverse through the thorax on their way to the abdomen. The mediastinum is a highly mobile region due to the loose connective tissue uniting its hollow visceral structures, and the elasticity of the lung and parietal pleura on each of its sides. This allows it to accommodate movement, volume and pressure changes in the thoracic cavity. As a person grows older, the loose connective tissue becomes more fibrous and rigid, limiting the mobility of the mediastinal structures. The mediastinum extends from the sternum and costal cartilages anteriorly to the bodies of the vertebrae posteriorly, and from the superior thoracic aperture superiorly to the diaphragm inferiorly. It is divided into the superior and inferior mediastinum. The inferior region is further subdivided by the transverse thoracic plane and the diaphragm into several smaller regions: the anterior, middle, and posterior mediastinum. The superior mediastinum lies posterior to the manubrium of the sternum, and anterior to the first four thoracic vertebrae (T1-T4). It contains several important structures that include the lower ends of the sternohyoid, sternothyroid and longus colli muscles, thymus remnants, great vessels and veins, the trachea, the esophagus, related nerves and the thoracic duct, in addition to the paratracheal, brachiocephalic and tracheobronchial lymph nodes. The anterior mediastinum is the smallest of all mediastinal subdivisions. 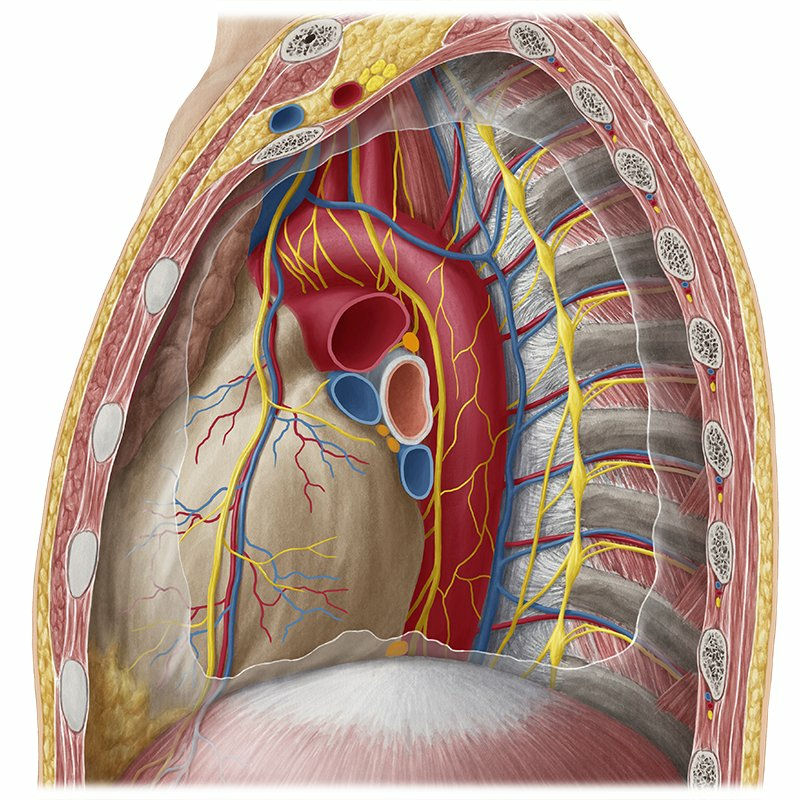 It is located posterior to the sternal body and transversus thoracis muscles, and anterior to the pericardial sac. It consists of loose connective tissue, fat, sternopericardial ligaments, a few lymph nodes, and branches of the internal thoracic vessels. In some cases, the anterior mediastinum may partially contain the thymus gland, or its degenerated remains. The middle mediastinum is the broadest part of the inferior mediastinum region. It is located centrally in the thoracic cavity, and contains the pericardium, the heart, the tracheal bifurcation, both main bronchi, great vessels, the right and left phrenic nerves, the deep part of the cardiac plexus, and the tracheobronchial lymph nodes. The posterior mediastinum is located posterior to the pericardial sac, and anterior to the vertebral bodies of the mid and lower thoracics (T5-T12). Its major contents include the esophagus, the right and left vagi, the thoracic duct, the thoracic aorta, the azygos system of veins, the sympathetic trunk, the thoracic splanchnic nerves, and the posterior mediastinal lymph nodes. Want to learn more about the Mediastinum? Lymph nodes and vessels of the mediastinum and thoracic cavity.